The Albemarle is a unique place—half land, half water. Our ever changing relationship with the water has defined our way of life. Water is both a highway and a barrier, a source of livelihood and inspiration. The story of this place is Our Story, a tale of how our communities have adapted to challenges and opportunities of our unusual home. This is a long-term exhibit with no closing date. The Official State Historic Boat of North Carolina was first built in the early 1880s by George Washington Creef of Roanoke Island. The shad boat on display here at MOA was built in 1904 by renowned boat builder and decoy carver, Alvirah Wright. This is a long-term exhibit with no closing date. This exhibition is based on excavations at a site along the Pasquotank River north of Elizabeth City. The site’s name comes from a bridge built before the Revolutionary War and noted by George Washington when he visited the area. At one time, ships could navigate to a customshouse and a set of warehouses, where workers unloaded and loaded cargo. Today, the only reminders of this once-important center of commerce include a few pilings and several vessels submerged just below the river’s surface, as well as a large collection of artifacts spotlighted in this exhibit. Excavations at the River Bridge site over the past seven years have yielded over 10,000 artifacts that date from the middle of the 18th century to the early 20th century. The artifacts’ condition, and the fact that many items remain intact, makes the site unique. These objects provide a glimpse into colonial and Federal period trade patterns in eastern North Carolina. The River Bridge site was first issued a permit number from the North Carolina Office of State Archaeology in 2011 with an objective to “explore a location in the Pasquotank River noted as an early colonial port.” The underwater excavations have yielded artifacts from pearlware, creamware, gray salt-glazed Westerwald stoneware, and earthenware dairy pans to case bottles and flasks, axes, faunal and botanical artifacts, shoes, shingles, and personal effects including chamber pots, scissors, and buttons. The exhibit will be on display until March 2021. The Museum of the Albemarle will open its latest small exhibit, Blue Lodges of the Albemarle, on March 16, 2019. This exhibition recognizes our Albemarle region’s Freemasons and the charitable works they perform in and around their communities. A fascinating assortment of artifacts, from several Albemarle Masonic Lodges, reveal both the fraternity’s rich history in Northeastern North Carolina and their time-honored philanthropic heritage. Blue Lodges of the Albemarle, remains on view through the end of 2019. This small lobby exhibition pairs local folk art with agricultural equipment for a tongue and cheek look at one of the world's most popular animals -- the chicken! Clucker Plucker, remains on view until November 16, 2019. Opening on April 8, 2019. The Museum of the Albemarle invites you to view the traveling exhibit from the Museum of History, The First Gulf War features eight informational panels, filled with photographs, recounting the conflict that began when dictator Saddam Hussein attacked Kuwait on Aug. 2, 1990. The resulting conflict became known as the Persian Gulf War of 1990-1991, when the United States led the most diverse coalition of nations in recent history in Operations Desert Shield and Desert Storm to oust Iraqi forces that had invaded Kuwait. The First Gulf War highlights Operations Desert Shield and Desert Storm, weapons of the Gulf War, and the liberation of Kuwait. The First Gulf War: The War to Free Kuwait, remains on view until July 27, 2019. Opening on April 25, 2019. 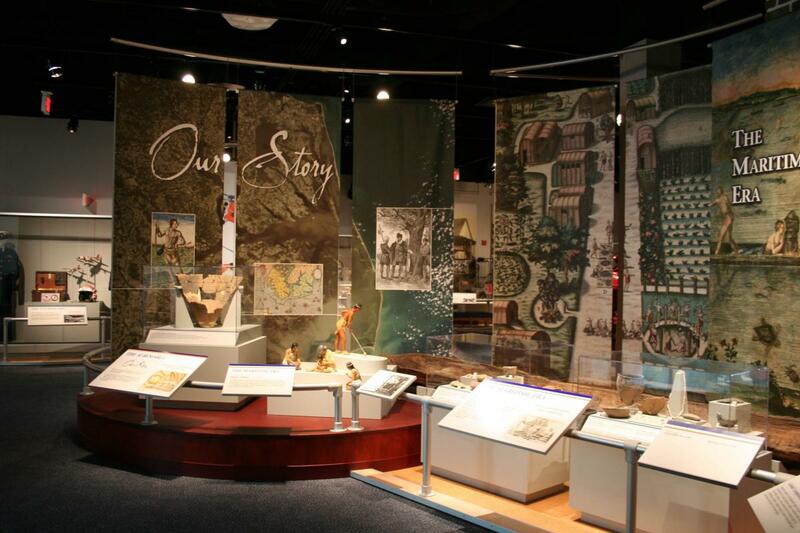 The Museum of the Albemarle invites you to view the traveling exhibit showcasing one-of-a-kind documents, maps, photographs, historic war-era posters, and other media from the State Archives of North Carolina. The variety of public records and private manuscript collections in Treasures of Carolina will focus on three themes: providing evidence of civil and property rights, government transparency, and the preservation of North Carolina’s history and culture. An 1839 petition for United States citizenship, signed by the Siamese twins, Chang and Eng Bunker, born in Siam (now Thailand). The brothers settled in Wilkes County and married sisters. Altogether the families had 21 children. A 1944 Mount Airy High School graduation list citing the name of Samuel Andy Griffith. Robert Glenn “Junior” Johnson plea dill. A hand-colored land grant from Tyrrell County from 1747. Bertie County Stock Marks, 1722-1741. A government record from Bertie County from 1728 describes and illustrates a variety of livestock brands used to identify an owner’s property. The exhibit will explain how different types of records are created and preserved. Visitors will get to view how records have evolved from 17th-century script on parchment to born-digital materials. Treasures of Carolina: Stories from the State Archives, remains on view until July 27, 2019.